opposite kind. Thus, in Fig. 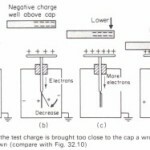 32.5 (a) a negatively charged rod has been brought near to the end A of a cylindrical insulated conductor AB. The shape of the conductor used does not matter: a cylindrical one is shown here merely for convenience in drawing. 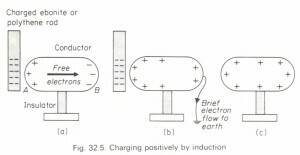 Some of the free electrons in the conductor are repelled towards B by the excess of electrons on the negative rod, thereby reating a negative induced charge at B and a positive induced charge at A. The conductor is now earthed by touching it with the finger, with the result that some of the free electrons are repelled to earth(Fig. 32.5 (b)). 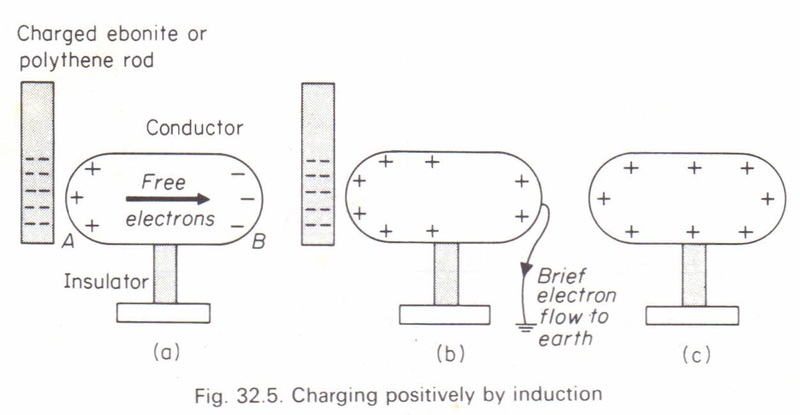 The finger is then removed from the conductor and afterwards the charged rod is taken away (Fig. 32.5 (e)). 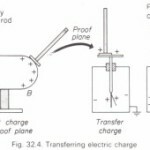 Tests with a proof plane and an electroscope can now be made to show that the conductor is positively charged all over its surface more electons are attracted from earth into the conductor. 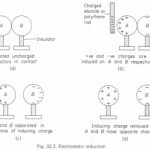 Finally, after breaking the earth connection and removing the charged rod the conductor is left with a negative charge.